Sothys new scrub containing white tea extract and rice powder. This easy-to-use skin polish is designed for all skin types except for sensitive or infected skin. Gently eliminate dead skin cells, refine the skin texture and reveal the radiance of the complexion. Shea oil - Leave skin nourished, soft and supple. Rice powder and circular silica beads - Gently eliminate dead skin cells. Use the Exfoliating scrub prior to Desquacrem or Morning Cleanser to combine exfoliation with deep action cleansing. Method: Apply 2ml to dry or slightly moistened skin following cleansing. Massage the scrub in rotating movements over the entire face and neck to exfoliate the layer of dead skin cells. Rinse off any remnant of the exfoliating grains from the skin and gently towel dry. Then apply SOTHYS Treatment Lotion, serums and creams according to skin type. Use 1-2 x per week. 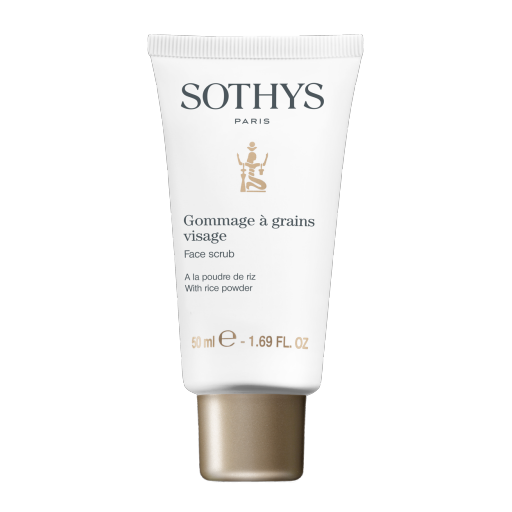 Although the exfoliating grains are very fine and smooth sensitive skin types should use the Gommage Exfoliant.